How to generate UAN using Aadhaar? Please note that the EPFO has now withdrawn the process of generating UAN using Aadhaar. So the below procedure is not valid anymore. Now all UAN generation will be done by the employer and then given to the employee. Welcome to this post of UAN generation using Aadhaar by employees. In a recent update, the EPFO (Employee’s Provident Fund Organisation) said that employees can now directly allot UAN for themselves. In this post, we will discuss the process of how to generate UAN using Aadhaar for any citizen in the unified portal. Previously, UAN generation had to be done by the employer only and this had to be done before contributing to the employees’ PF contribution. Establishments with a large number of new joiners are facing difficulties in the generation of UAN. This resulted in mismatches of input data with Aadhaar. In order to simplify this, EPFO launched Direct UAN Allotment Services for employees. So, any Indian citizen (prospective employee) can generate his/her UAN on the basis of Aadhaar number. The introduction of this new Direct UAN Allotment service will save a lot of time. Employees and Employers will both be happy with this service. We will now take a look at how an employee can generate the UAN number. Important: For this procedure, you will need your Aadhar and the mobile number linked to Aadhar in hand. This is for verification of KYC with OTP. 1. Go to the EPFO member portal. At the bottom right corner of the screen, you will see “Online Aadhaar Verified UAN Allotment”. Click on that. 2. In this screen, you will have to provide your Aadhar number and generate an OTP for verification. Make sure you have your mobile handy (The mobile number which is linked to the given Aadhar). You will receive an OTP to your registered number. 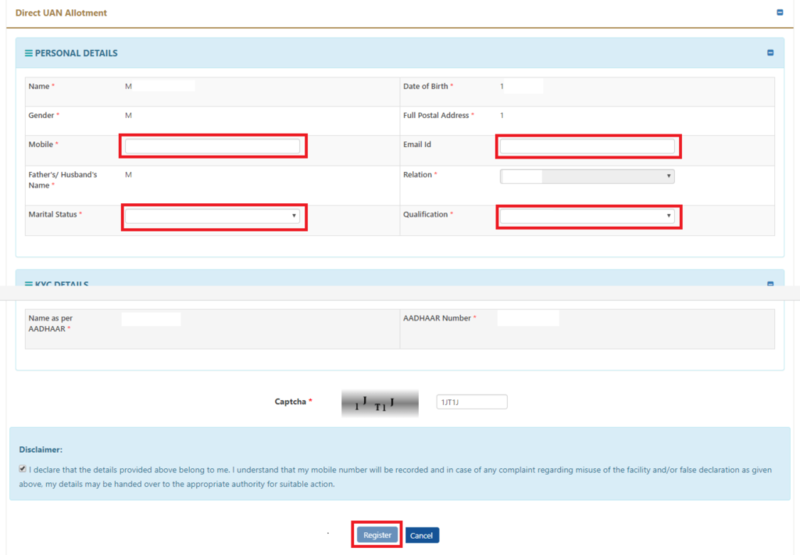 You have to enter the OTP and agree to share the Aadhar details with EPFO and click on “Submit” button. 3. Once you submit the Aadhar number, all your details will be fetched from the Aadhar database and displayed. 4. If all the details you provide are correct then, the next screen will be a success message which will show your new UAN. Copy the UAN for further use. Success!! You have now created a UAN. This will be useful for your current employment and any future employment as well. Your next step is to activate the UAN. You can find the procedure for UAN activation here – UAN Activation Procedure. Thank you for the information. We will try to update our content ASAP. I need to get my UAN how do I get it? Please contact your Employer for your UAN. Why is online aadhaar verified uan allotment not appearing anymore on the site? Currently, EPFO has withdrawn this facility.